10:55 GMT - As nervousness spreads across Europe following the devastating attacks in Paris, London's Gatwick Airport's North Terminal is evacuated as a "precautionary measure". 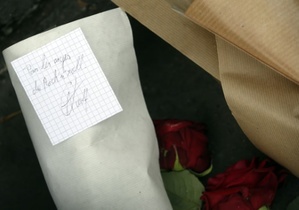 10:59 GMT - The Islamic State jihadist group has claimed the Paris gun and bomb attacks in a statement posted online. It said "eight brothers wearing explosive belts and carrying assault rifles" conducted a "blessed attack on... Crusader France." 11:08 GMT - US Secretary of State John Kerry says the Paris attacks, and other recent acts of terror, show the world is witnessing "a kind of medieval and modern fascism... which seeks to destroy and create chaos." 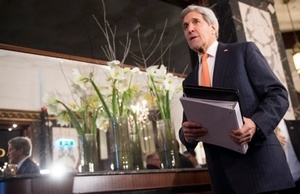 "The one thing we could say to those people is that what they do in this is stiffen our resolve, all of us, to fight back," Kerry says, declaring the attacks had spurred diplomats gathered in Vienna for talks on Syria to "do even harder work to ... help resolve the crises that we face". 11:25 GMT - AFP's Frederic Pouchot reports that heightened security measures are very much in evidence on the streets of Paris. "I have just passed Montparnasse train station," he says. "Military in combat clothes are guarding the entrances in a very visible way, machine guns over their shoulders, and messages from the security services are broadcast on the screens and loudspeakers. "The crowd seems more or less normal on the main rail lines for a Saturday but less than usual on the suburban trains." 11:34 GMT - The IS statement, published in both Arabic and French, threatens further attacks against France "as long as it continues its Crusader campaign." It says the targets of Friday's attacks, which included the national sports stadium and the Bataclan concert hall, "were carefully chosen". It says France is guilty of "striking Muslims in the caliphate with their aircraft". 11:50 GMT - AFP journalist Francoise Kadri reports that cafes are open in the Stalingrad neighbourhood, 10 minutes' walk away from the Place de la Republique. Some people are sitting outside on a grey and cold day in the French city. She reports there are fewer people than usual for a Saturday but there are joggers and dog-walkers around and in a surreal way it's almost normal. 12:00 GMT - Syrian President Bashar al-Assad says French policy has contributed to the "spread of terrorism" that culminated in the Paris attacks. In a meeting with a delegation of French lawmakers in Damascus, Assad said France's "mistaken policies... had contributed to the spread of terrorism". "The terrorist attacks that targeted the French capital Paris cannot be separated from what happened in the Lebanese capital Beirut lately and from what has been happening in Syria for the past five years and in other areas," he said. 12:02 GMT - "I am shaken, I don't understand these things, done by human beings," says Pope Francis during a telephone interview with TG2000 television. "There cannot be justification, religious or human. It's inhuman." 12:09 GMT - Bavaria's state premier Horst Seehofer says there is "reason to believe" a man arrested last week with several weapons in southern Germany was linked to the Paris attackers. "There is reason to believe that this is possibly linked" to the attacks, Seehofer told a party conference. Police had confirmed the arrest on November 5 during a routine check on a motorway, saying "many machine guns, revolvers and explosives" were found in the suspect's vehicle. 12:24 GMT - In the Place de la Bourse, a large square near the Paris Opera, traffic is unusually thin and there are few pedestrians about. 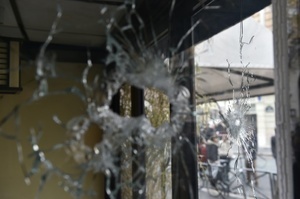 "People are worried," Jean-Louis Masson, 50, who lives locally, tells an AFP reporter. "You can see that in the SMS messages that are going around. We were concerned for one of our children who was out last night, and we called to make sure she came home." 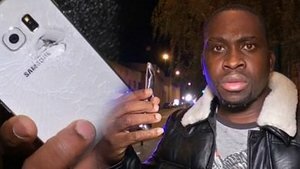 12:30 GMT - Terrified survivors from the Paris concert hall have described fleeing over bodies to hide after gunmen began executing rock fans in a barrage of automatic gunfire. "It was horrible inside, a bloodbath, people shot in the head, people who were shot as they were lying on the ground," said a police officer who took part in the operation to storm the venue where 1,500 people had been attending a rock concert. 12:32 GMT - "At first we thought it was part of the show but we quickly understood," says radio presenter Pierre Janaszak, who was sitting in the balcony with his sister and friends when they heard shots from below about an hour into the concert. They hid in a toilet where they would spend the next two hours waiting for police to storm the building. 12:35 GMT - By Saturday morning the historic venue known for hosting rock concerts was still cordoned off, its gaudy red-and-yellow facade showing little sign of the carnage inside, an AFP correspondent reports. One of the policemen involved in storming the venue returned early on Saturday, saying what had happened had not yet sunk in for him. "I went back home to reassure my children. Now I've just come back as a person" to try and comprehend the horror, he says, "to do sort of a personal debriefing. You simply cannot remain indifferent." 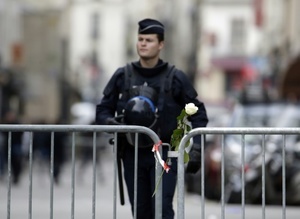 12:41 GMT - French police are urging people not to spread false information and rumours. 12:43 GMT - British Prime Minister David Cameron has warned that "a number" of British casualties are expected from the Paris attacks. "We must be prepared for a number of British casualties," he says after an emergency cabinet meeting in Downing Street that kept the threat level for Britain at "severe" -- the second highest. 12:55 GMT - France will hold a minute's silence on Monday for the victims of the Paris attacks, the office of Prime Minister Manuel Valls says. 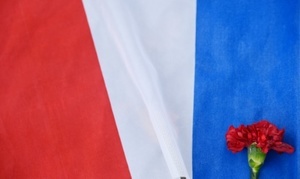 The observance will take place at midday (1100 GMT), and flags will be lowered to half mast. 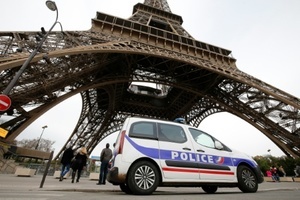 13:32 GMT - - Islamic State jihadists claim responsibility for a series of coordinated attacks by gunmen and suicide bombers in Paris that killed at least 128 people in scenes of carnage at a concert hall, restaurants and the national stadium. 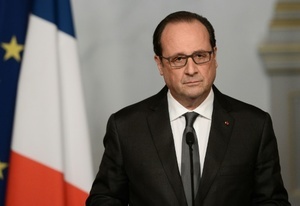 - French President Francois Hollande calls the coordinated assault on Friday night at six different sites an "act of war". - No arrests had been made by midday Saturday. Police are screening hours of CCTV footage of the attack sites and are attempting to identify the body parts of the attackers. 13:59 GMT - More on the earlier situation at London's Gatwick airport. The North Terminal was evacuated and a man arrested after the discovery of a suspect package. Bomb disposal experts were on the scene, and extra airport staff drafted in to look after passengers. "At this time, we are investigating the circumstances of the incident and it is too early to say what the item may be," says detective superintendent Nick May. 14:04 GMT - In a sign of potential strife ahead for Europe, an incoming Polish minister says the country will not take in refugees under a hotly contested programme to distribute them among member states because of the Paris attacks. "The European Council's decisions, which we criticised, on the relocation of refugees and immigrants to all EU countries are part of European law," the incoming European affairs minister Konrad Szymanski writes on right-leaning website wpolityce.pl. 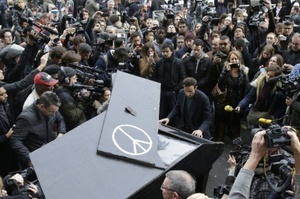 But "after the tragic events of Paris we do not see the political possibility of respecting them," he says. 14:12 GMT - The France-England friendly match scheduled to take place at Wembley on Tuesday will go ahead, according to the French football federation. "After talks with the English FA ,who assured us there was no particular risk in holding the match, we decided to go ahead," a federation spokesman tells AFP. "If British authorities came to re-evaluate the situation, obviously the question of holding the match or not would be addressed." 14:23 GMT - A French national is believed to be among four men who stormed the Paris concert hall, police and a source close to the investigation say. Investigators said they found the body of a French national who was known to intelligence services and indicated he was likely one of four men who attacked the Bataclan concert hall late Friday. They did not give details of his identity or his background.